A good calf stretch is vitally important to the ankles, feet and overall movement. Remember, your feet are what come into contact with the ground and tight calves will severely inhibit your ability to move safely and effectively. That puts your ankles at high risk for a sprain and can also put your knees at risk. It can also severely slow you down which can negatively effect sports performance. One of the first things you will see a trainer do in an assessment is ask a person to do a squat. Usually, the person cannot go down very far and does the squat poorly. Then, the trainer will give the person a small block to place their heels on and then they will do the squat again. Magically, they will be able to do a perfect squat! Why? The block enabled the person to do a squat without their tight calves inhibiting them. It’s a pretty powerful demonstration of how much tight calves can inhibit movement. You can try it yourself at home… just try to do a squat and then try again by placing a thick book under your heels (leave the balls of your feet on the ground). You will see a huge difference! Just keep your lower body in the exact same place, but lean your upper body slightly to the right. If you are stretching the right calf, you will immediately feel the stretch on the outside of the calf. After a few moments, lean to the left and you will the stretch on the inner part of the calf. This makes such a huge difference in the overall quality of the stretch, it is hard to underestimate. It adds a few extra seconds, but you will actually be stretching the entire calf muscle complex instead of just a part of it. I would suggest spending about 10 seconds on each part of the calf (right, center, left) and then repeat 2-3 times total. This is a more advanced calf stretch that will help you increase flexibility dramatically in the calves. The best part? You can do it anywhere (just like stretch #1) and it is very simple to do. As you can see from the image on the left, all you need is a wall. 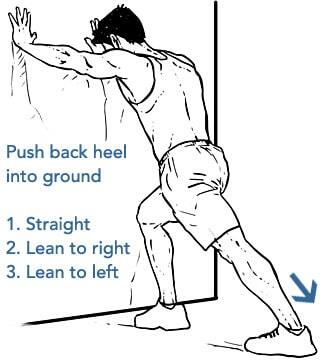 Place your hands on the wall, but the calf you are stretching will be touching the wall. Curl your toes up and place the ball of your foot on the wall. Again, make sure you keep your shoulders down and stand up straight. You will feel a good stretch in the center of your calf. Okay, now you can lead side to side just as in stretch #1. Make sure you lean to the right and then to the left, so you stretch the inner and outer calf. Again, I would suggest spending about 10 seconds on each part of the calf (center, left, right) and then repeat 2-3 times total. Calf stretches #1 and #2 focus more on the upper and middle part of the calves, but you do not want to ignore the lower calf and achilles (remember Kobe Bryant’s achilles injury). So, here is a really awesome stretch that gets the lower calf and achilles tendon. These areas are usually ignored and really help ankle mobility and overall movement. Okay, to do this stretch, you will be in the same position as the image in stretch #2. The only difference is that you will bend the knee of the calf being stretched (the leg of the foot touching the wall). You will immediately feel the stretch in the lower calf and achilles. Again, stretch the center for about 10 seconds, then lean to the right and left for 10 seconds each. Then, repeat the whole stretch 2-3 times. Once you have completed these calf stretches, walk around for a few moments and see if you can feel a difference in how you walk and move. Most people notice a big difference. These stretches only take a few minutes, but will really help you protect the calves and improve athletic performance by improving healthy range of motion. I created a whole rehab and prehab program for the calves and ankles, called the H.E.M. Ankle Rehab Program. Whether you have a recently sprained ankle, weak ankles or an old injury, you will experience profound benefit by properly healing the ankles and calves and significantly improving strength, stability and healthy range of motion. Not only does it help you throw away those ankle braces and significantly reduce the risk of ankle sprains, it also helps you improve athletic performance for dramatic short and long term benefits. In the meantime, try these calf stretches and I truly hope they help!